In November, voters will be asked to vote on the East Rail Plan. Project Connect, however, has not been transparent with voters about the hidden costs of their plan. As editor of the North Austin Community Newsletter, I have made some comments and responded to questions on this piece. The information in my comments addresses the hidden costs of this plan that Project Connect has not been transparent enough about. Please understand this a NACN opinion piece --at the end of the day, its your vote! Even if we toss out the arguments about which route is best, we still have the problem with the price per mile. 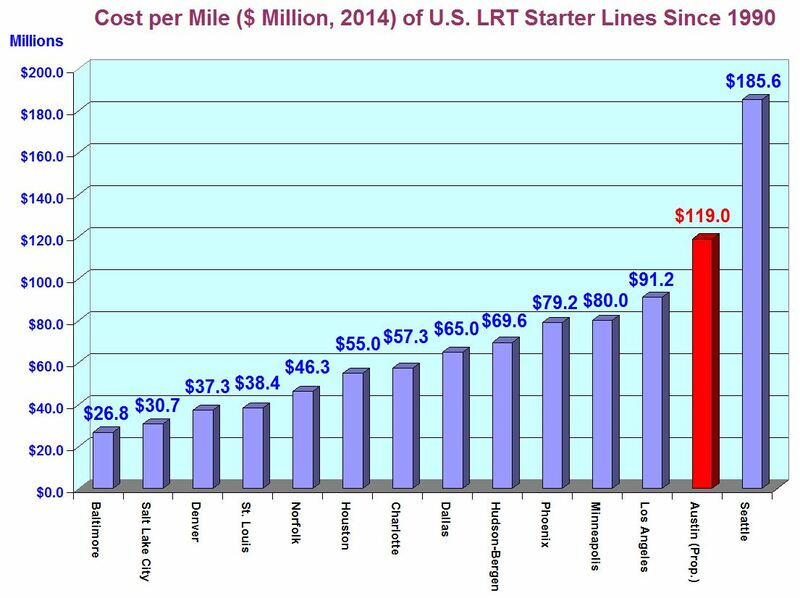 If you look at rail starter lines, adjusted for 2014 numbers, the cost used to be $40-65 million a mile. These days, a starter rail line is now $65-75 million a mile in the US, and more like $80 million a mile in Texas. Project Connect's proposed rail line? $119 million a mile. At 9.5 miles, taxpayers are paying at least $370 million dollars too much for this route--more if we looked at what the cost of rail is outside of Texas. Austin has an affordability issue--that's the one thing we all can agree on. The City should not have proposed a rail line that is going to cost 50% per mile, the Mayor should not have backed such an expensive project, and groups like RECA and Sierra Club should be ashamed of themselves for supporting such a huge waste of tax dollars. Build the line for $65-75 million a mile. Or better yet, take a page from Denver's book. Refuse federal dollars because of the extras the Feds force the project to include, and refuse to contract it out. Denver's Public Works department built their starter rail line in-house for $38 million a mile, adjusted for today's dollars. If we did that, we could take some of the savings and put it towards much-needed buses and sidewalks. Are these figures adjusted to today's dollars? Yes, these numbers adjusted for 2014 dollars. It makes sense to build the most expensive sections first (bridge over the lake, redline crossing). The Federal government is paying 1/2 of the cost of our 1st section under the FTA's New Starts program. There are three things you should know about Project Connect's promise that this will be paid for by Federal dollars. I think its safe to say that Project Connect's assurance that we will get federal funding for this project is premature. The EIS issue is another one of those hidden costs that Project Connect has not been transparent about. One has to wonder how many more tax dollars will have to spent for the EIS, and when does Project Connect think the study will be completed? If the need for the study adds two, possible three years to when we can request funding, that's significant and should be conveyed to the voters. We can argue about the route all day long, but we need to realize there is some serious dollar and cents issues here, and one of those is there is no guarantee of when, if ever, the FTA will pay for this project. Mary, the ballot item specifically states that the project will not move forward without Federal funding, so all these really dubious claims are just more smoke to obscure the real issues. Let's step back to 2004. We were promised the Red Rail would cost 60 million, plus 30 million from the government, and be built by 2008. Now lets jump to 2010, The Red Rail was finally opened in 2010, cost $105 million, and was paid for solely by Austin taxpayers, with no federal funding. So I would argue that the potential problems with Federal funding should be viewed by voters as much more than just smoke and mirrors. If we don't get the federal funding, what will Cap Metro do?